Because of its location between Northern Plains oil fields and coal mines, Canada's tar sands, and overseas markets, the Salish Sea has become a key location for the shipment of fossil fuels. The Salish Sea includes Washington's Puget Sound and Hood Canal, the Strait of Juan de Fuca, and British Columbia's Strait of Georgia. While many corporations see the Salish Sea as a potential fossil fuel gateway, they are met by resistance from environmentalists, tribes/First Nations, and other residents who are concerned about the sea's environmental health. The shipment of fossil fuels from the Salish Sea could provide an economic boost for the region but also poses major economic risks. Many activists and environmentalists believe the economic benefits do not justify the risks to our environment and public health. This page will provide an overview of the proposed fossil fuel terminals on the Salish Sea, tribal concerns, the environmental effects of the shipment of fossil fuels, and activists' responses to the proposed terminals. Washington State already has five terminals from which oil is shipped and more are located in British Columbia. As of October 2015 there were 18 proposals to either build a new fossil fuel terminal on the Salish Sea or to expand an existing one. Most of the proposed projects would be located in Vancouver BC which would endanger the Strait of Georgia, the northern portion of the Salish Sea. 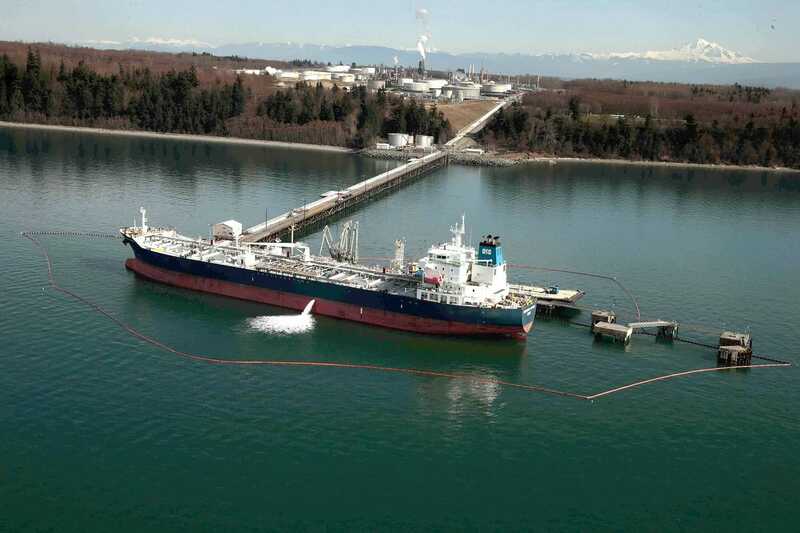 Friends of the San Juans and and San Juan Islanders for Safe Shipping have estimated there would be a 43 percent increase in transits of ships carrying oil if the 18 proposed oil projects in the area are developed (Island Sounder). Each of these projects, if developed, would pose a risk to the Salish Sea in the form of potential oil spills (See Oil Tanker Spills). Kinder Morgan’s Trans Mountain Pipeline would pose the most risk (See Kinder Morgan). In the event of a 43 percent increase in ship traffic, the Salish Sea's risk of suffering an oil spill would go up significantly. According to Eric de Place of Sightline Institute, the risk of oil spills could increase even more than 43 percent because the risk oil spills doesn't increase with ship traffic in a simple one to one manner. If 43 percent more ships travel on the Salish Sea, then more ships will use narrower, less navigable paths through the sea. Ships traveling narrower, less navigable paths face a greater risk of oil spills because they are more likely to run aground or encounter an obstacle (de Place; Stroming). In the event that an oil spill due to a new oil terminal, it could cause much more damage to the environment than previous oil spills because the new ships could carry much more oil than previous ships. “They [the Lummi] have been given areas where they can fish in. Traditional Lummi fishing and crab-potting goes on right in the same area where the ships would go to collect the coal. And so, the Lummi say that these huge ships coming through and the wake that they create will affect their ability to fish in that area, not to mention if there's an accident which could completely wipe out the ecosystem in the area” (Everett Interview). Along with other tribes, the Lummi have worked to raise awareness of the massive amounts of fossil fuels being shipped to the Pacific Coast and it's effect on indigenous nations. In 2013, the Lummi organized a trip to the Otter Creek Valley of Montana with a traditional hand-carved totem pole. From there, they embarked on a 2,500 mile journey to the Pacific Coast, connecting with other indigenous nations on the way (Everett). May 2016, the Army Corps of Engineers rejected the Cherry Point coal terminal permit, due to the coal terminal’s impacts on Lummi treaty rights (Wohlfeil). “It [coal] does not stay well contained. And on top of it we're talking about a fifty million ton pile of coal on the water. In Canada, they've had big problems with big windstorms blowing coal all over the area up to fifty miles. So there's a lot of issues with runaway coal. And since we are surrounded by water that's where a lot of it goes” (Everett Interview). Coal has a number of negative effects once it gets into a body of water. Heavy metals such as lead, thorium, mercury, arsenic, and uranium are introduced into the water which can harm marine life accumulate in their tissues. In areas where coal is shipped, coal dust has been to compose up to three percent of marine sediments, yet the effects of coal dust in marine sediments have not been well studied. Water quality may be affected by coal shipments in ways that are not yet understood (Everett Interview). Coal dust that gets into the air can harm human health because of the very small size of the particles which can get into human lungs. Human consumption of fish from waters contaminated by coal is hazardous due to the bioaccumulation of toxic chemicals in their tissues. For these reasons, the export of coal has effects on human health, yet these effects can easily be avoided. Using the Salish Sea as a fossil fuel gateway would also increase fossil fuel emissions from our region because fossil fuels must be burned in order to ship such large amounts of material. Even if the fossil fuels shipped from the Salish Sea are burned far away from our region, this will still have negative effects on our region because of its contribution to the greenhouse effect and ocean acidification. In order to prevent the development of new fossil fuel infrastructure on the Salish Sea, activists have turned to direct action and lobbying. For example, the Sierra Club's Power Past Coal has been successful in preventing coal terminals from being developed in Oregon and Washington, and closing down coal plants in the region. The Sierra Club has put over 200 coal plants on retirement (including ones in other states) in only six years and they continue to fight for clean energy over oil and coal. While the Sierra Club failed to get legislation on climate change passed six years ago, the club recently released a report stating that Washington State’s carbon emission levels are back down to 1990s levels. Robin Everett claims that our carbon emissions are lower than they would have been had the climate change legislation been passed (Everett). This was accomplished simply by taking down one coal plant after another rather than passing sweeping legislation. Corporations' plans can be shut down despite their money and power when citizens are united in and vocal about their objections. Meanwhile, activists have made public demonstrations against the use of our waters for fossil fuel shipment. In April 2015, activists in kayaks surrounded Shell's ship the Noble Discoverer as it entered Seattle “figuratively positioning themselves against the momentum of decisions made behind closed doors" (Brownstone). The activists unfurled banners within the view of the ship. This was a very dangerous act, and while they did not succeed in preventing the ship from leaving the Salish Sea, they succeeded in bringing the public's attention to the issue and Shell later canceled the drilling. Brownstone, S. (2015, April 8). Can a flotilla of kayaks block Shell's arctic drilling rigs in Seattle? The Stranger. De Place, E., & Stroming, A. (2015, February 4). Salish Sea ship traffic: The impact of coal and oil plans. Sightline Institute. Everett, R. (2014, August 23). Lummi totem pole journey. Sierra Club. Everett, R. (2015, November 12). Skype Interview. Friends of Ecological Reserves. (2013, November 5). Kinder Morgan and tanker traffic in the Salish Sea. News/Reports. Island Sounder. (2015, October 4). Salish Sea vessel traffic to increase. Island Sounder News. Wohlfeil, Samantha (2016, May 8). Army Corps rejects permit for coal terminal at Cherry Point. Bellingham Herald.